Meet Sheridan*. She’s a 27 year old female who signed up for 23andMe during one of our sales. Adopted at eight months, she has no information about her biological roots and the adoption agency has no records other than where she was found — on the steps of a church in a small town near Atlanta, Georgia. She otherwise had an uneventful childhood growing up with her loving and supportive adoptive family. Now married and thinking of having kids of her own, Sheridan wishes more than ever that she knew something about her background. Even simple things — like her ethnic heritage — are a mystery to her (the only thing she knows is that she’s likely to be mixed race). While 23andMe can’t provide all the answers, its many tools and features might reveal some interesting clues about where Sheridan came from. Sheridan recently got her 23andMe results. She was a little nervous about logging in to see them at first but a few days later she gets a sharing invitation from her friend Mesut, who had agreed to sign up for 23andMe with her. Sheridan’s a little rusty on her high school biology so she calms her nerves and beefs up her genetics knowledge using 23andMe’s “Genetics 101” educational material. Then she accepts Mesut’s sharing invitation and clicks on the first link under “My Ancestry”: Maternal Line. As we mentioned briefly in our first “Ancestry at 23andMe” post, the maternal line is traced through mitochondrial DNA, which is found in the parts of our cells that turn food into energy. All of us inherit our mitochondrial DNA from our mother, and so we can use it to learn something about where our mother’s mother’s mother’s ancestors came from. This is possible because as DNA is passed down through the generations, errors in copying, known as genetic variants or mutations, may occur. A maternal haplogroup is a family of mitochondrial DNA types that traces back to a single mutation in a specific individual, usually representative of a significant event (e.g. a migration or development) in human prehistory. The first thing Sheridan sees under Maternal Line is a map of the world and her “Maternal Haplogroup”, “H2a” above it. The colors on the map indicate where in the world the H2 haplogroups are most commonly found — at least before oceanliners and 747’s made intercontinental travel a simple endeavor. The “History” tab at the top of the page has even more information about H2, and H2a specifically; in fact, H2a is especially common in eastern Europe. This is Sheridan’s first concrete clue about her mother’s ancestry. She’s also amused to learn that this haplogroup originated in or near what is now Turkey, since this is where Mesut is from. That’s when Sheridan notices a list of people on the right side of the page. There’s “Chinese Person” and “Japanese Person”, and clicking on them changes the map to show their haplogroups’ global distributions. Mesut is also in the list, since they are sharing genomes with each other at the “Basic” level. 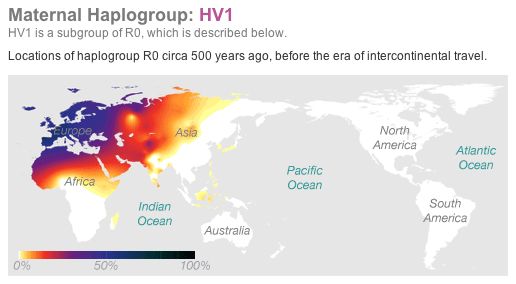 His maternal haplogroup is HV1, an ancient haplogroup that’s found across eastern Europe, central Asia, and northern Africa but is relatively rare in modern-day Turkey. For 23andMe customers interested in the nitty gritty details, check out the Haplogroup Tree Mutation Mapper under Ancestry Labs (Ancestry Tools). This will show you the SNPs used to define a particular haplogroup, starting with the mutation that defines that haplogroup’s most recent branch on the tree and working backwards to the root. The results in the Paternal Line analysis are presented similarly to the Maternal Line. Even if you have no Y chromosome, you can still learn about all of the different paternal haplogroups through the sample individuals and Haplogroup Tree. And since Sheridan is sharing with Mesut, she can see his paternal haplogroup, too. In just five or ten minutes, Sheridan learned some interesting things about where her mother’s ancestors — and she, by extension — might have come from. As a bonus, she was able to find a connection, however ancient, between herself and her friend. Still, the DNA that goes into maternal and paternal line analyses makes up less than 1% of all the DNA that 23andMe analyzes, and those ancestors represent only one or two branches out of a full family tree. To fill out the other branches and the rest of her genome, Sheridan will have to look at the other Ancestry features at 23andMe. Next time, we’ll take a closer look at the Global Similarity and Global Similarity:Advanced features, and reveal another clue about Sheridan’s ancestry as told through DNA. Maternal Line — Uses mitochondrial DNA passed down from your mother to trace the origins of your mother’s mother’s mother’s ancestors. Paternal Line — (Results generated for men only) Uses Y chromosome DNA passed down to sons from their fathers to trace the origins of their father’s father’s father’s ancestors. Haplogroup Tree Mutation Mapper (Ancestry Labs/Tools) — Reports the SNPs used to define specific haplogroups. Keyword: Haplogroup – A term used to describe individual branches or closely related groups of branches on genetic family trees. Defined by particular genetic mutations that are shared by all the people who belong to the haplogroup. What Can You Learn? – An overview of 23andMe’s ancestry features. (next) Sheridan’s Global Origins – Sheridan compares herself and her friends to various populations around the world. Sheridan’s Got Relatives – Sheridan responds to a fifth cousin and discovers a predicted second cousin in the 23andMe database. Finding Connections – Sheridan and Brian bond over their fourth cousin connection. Old Roots and New Horizons -Sheridan and Brian put together the pieces to sketch out their shared family tree.